Lucy Francka, a junior at St. Martin School in Jefferson City, is a multi-sport standout and terrific student. She is one of four children in a tight-knit, faith-filled family. And for the past three years, she has also been battling an eating disorder. After spending most of her 8th grade year in a rehab center 5-hours away from everything she knew, she returned home with a renewed spirit. Shortly thereafter, however, she succumbed to the eating disorder once again and spent a few more months receiving treatment. Lucy then returned to the welcoming arms of her family in July 2013 and has stayed there since her homecoming over a year ago. Lucy is the epitome of resilience. She is the face of a fighter. She is the definition of strength. And she’s only 16 years old. In fact, with nothing more than a desire to reach out to other women who may be silently suffering with similar struggles, Lucy has single-handedly coordinated an event to bring awareness to eating disorders. When she was officially informed that she had an eating disorder, the diagnosis sent her spiraling. She had never even heard of these things, much less had friends talk to her about their own struggles. So, surely she was the only person in her hometown who was going through something like this. Or so she thought. It shocked her to learn that women all around her may be quietly fighting their own battle in this invisible war. Yet, the first step in eliminating this disease is by actually speaking out about it. 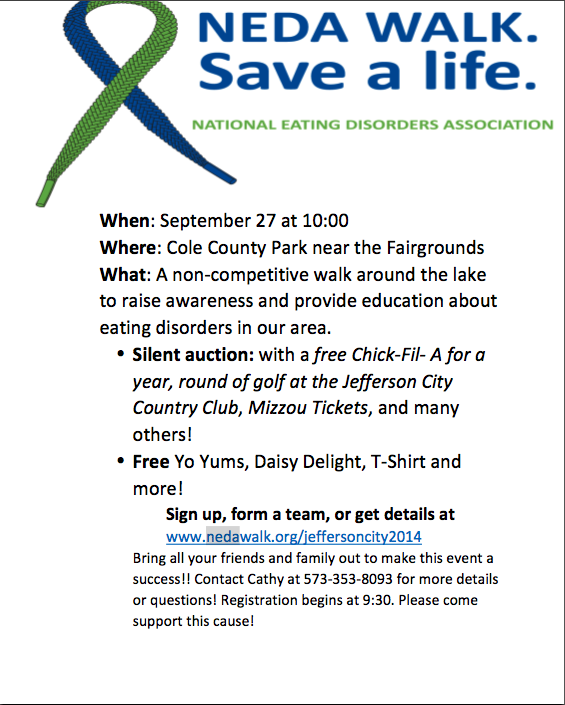 So, in an attempt to rally the troops and break the silence, Lucy plans to share her story with those who attend the NEDA Walk in Jefferson City on September 27, 2014. If you have ever battled anything like this (or known one of the 30 million other Americans who have), you really don’t want to miss out. United we stand. Divided we fall victim to horrors like this. Eating disorders have claimed too many casualties already. So suit up, soldier, because the NEDA Walk in Jefferson City is a real-life opportunity for our strength and compassion to unite and conquer this vicious enemy.